You know that depressing time of year when you de-decorate your Christmas tree and it is sad and dry and brown and then you drag it, shedding needles all the way, to the curb for tree pick up? You know, how, for days, you drive down the street pass brown, silent, sad trees–one per house, and you think, “what a waste”? This year I would have none of it. I wanted to do something joyous and fun to start the new year that would use the tree that stood in my house for a month and made me so happy during that time. I decided I would cremate my tree and scatter its ashes over the beach. But why stop with one tree when there so many trees that deserved a respectful ending. An ending that acknowledge the joy that tree brought to a house. An ending that would cause us to welcome this coming year and the next time we can chop down hundreds of trees in their prime and stick them in a bucket of water in our living rooms to slowly die. Also, I really like fire. So I started collecting trees off the curbs and sticking them in my truck. I really really like fire. 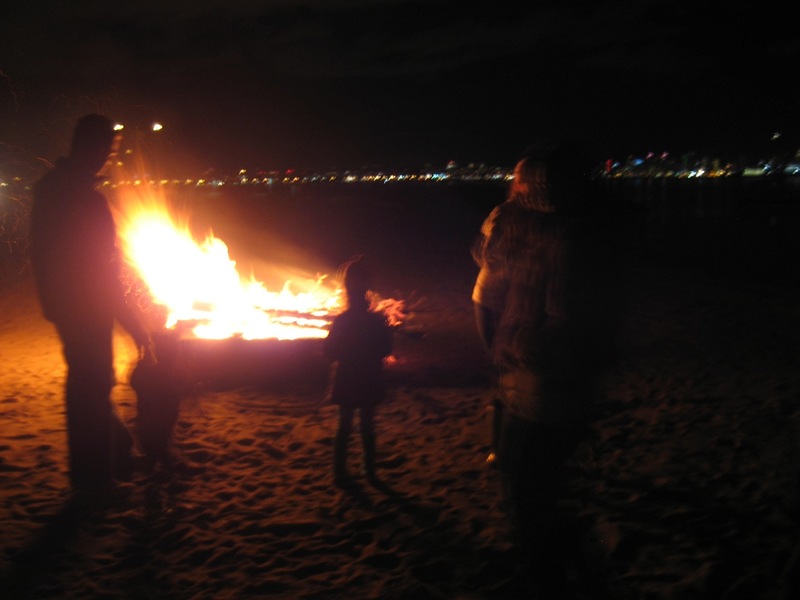 One Friday night, just after the new year, three adults and four kids headed to the beach to burn some trees. As we dragged the trees down to the beach, one friend assured me that she’d take care of the kids when the police came to arrest me and her husband. We set up the picnic dinner of pizza and hot chocolate on blankets near the fire pit. The kids flittered up and down the sand dunes, stopping for grainy bites of pizza. In a rare flash of motherly wisdom, I decided we should shift the blankets back from the pit just a little bit more. All set up with victuals, it was time for the trees. We weren’t really sure how many trees to do at once, so we started with three just in case the fire got really big. We didn’t want to be too aggressive since we all thought we knew that Christmas trees can really burn. FYI Christmas trees can really burn. We stood the three trees up in a teepee formation in the middle of a fire pit, jostling them this way and that so they’d support each other. We didn’t realize that there were already some live embers from a previous fire below the trees. 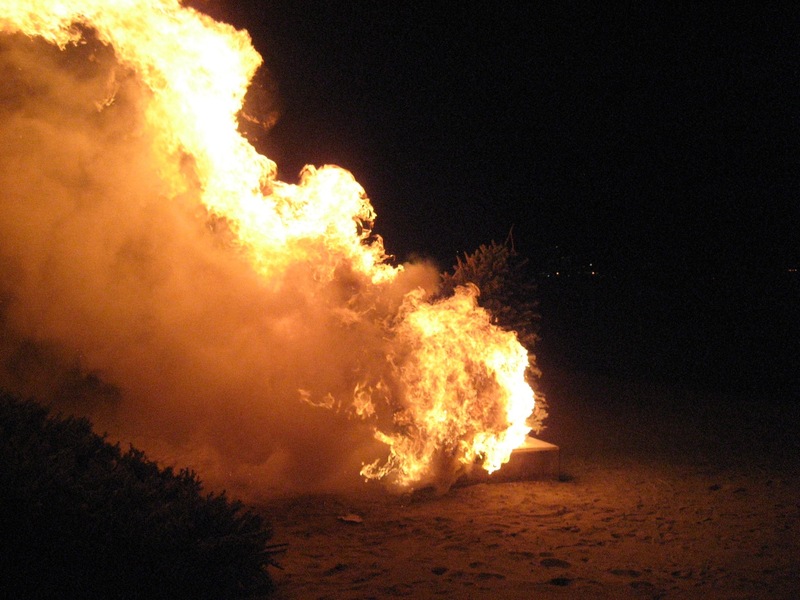 FYI Christmas trees can really really burn. In a quick flash, one tree ignited, causing the other two to burst into a towering, 30-foot tall inferno. The kids screamed as dark smoke and sparks flew up the hill towards our cars and the hotel just across the street. We may have made a mistake, I thought. 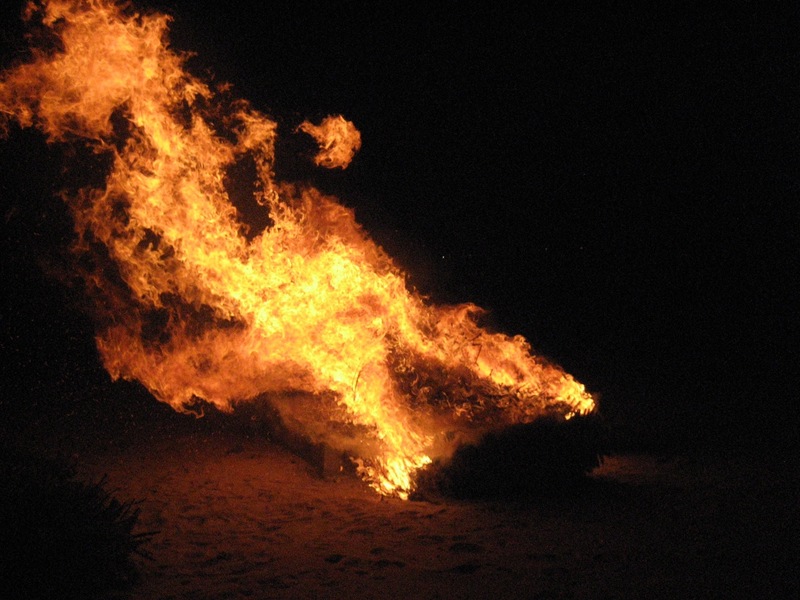 One tree could stand no longer and crashed to the sand in a burst of flame–right where the blankets had initially been sat up. My friends and I looked at each other. Then as quickly as it started, the trees burnt out, leaving behind only the charred skeleton trunk. Just as the coast guard boat cruised by. The rest of the night, we burned trees one by one as the kids sang “Oh Christmas Tree, Oh Christmas Tree” with some added lyrics of their own. A few more friends showed up, bringing a guitar. As San Diego shimmered behind us, I thought there was something to burning these trees. For one last spectacular time, they brought people together in song and good cheer. I only wish I had gathered more. 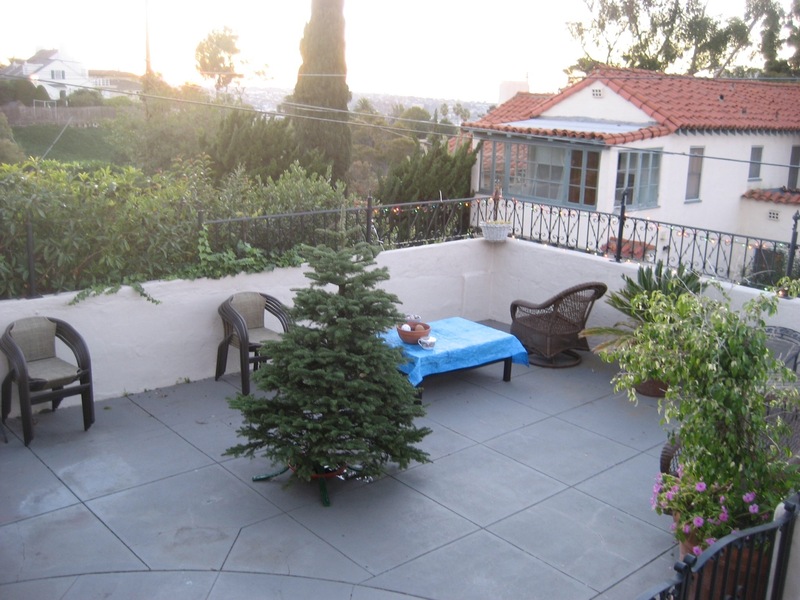 Tags: 1000 words, Christmas, San Diego, tinyman. Bookmark the permalink. I like Fire TOO! muwahahaha!!! !